I'm a visual learner with a limited attention span, and I like to draw. So, when I teach and train, I use cartoons, visual metaphors, and pop culture references as (hopefully) entertaining mnemonic devices. Above is a picture of me spieling about Community Cooperative Advocacy (more on that in an upcoming post) with some of my drawings in the background. It's big fun getting participants to guess what in Sam Hill the pictures have to do with anything. At last year's American Bar Association Dispute Resolution Section Conference in Denver, Temple Grandin (http://en.wikipedia.org/wiki/Temple_Grandin) delivered the most engaging keynote speech I've ever heard. It all boiled down to this quote: "The world needs different kinds of minds coming together"...meaning we need to embrace and unite different forms of learning -- auditory, visual, verbal, mathematic, kinesthetic, and so on. 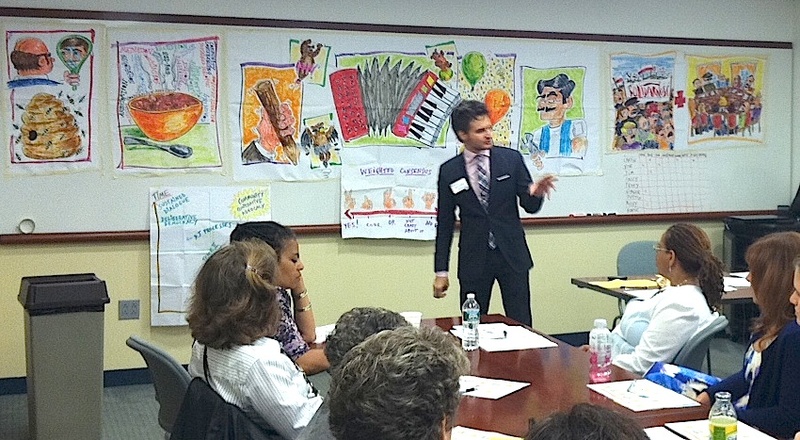 This inspired me to find more ways to include visual thinking in our work at New York Peace Institute. Peacebuilding luminary John Paul Lederach's elicitive approach to international conflict resolution is all about drawing out people's own ideas and solutions. Taking that quite literally, we now cover our mediation tables with butcher paper and have markers and crayons at the ready. Clients can draw the layout of their apartment, illustrate their ideal vision, or just doodle to alleviate their anxiety. Mediators with a creative flair can colorfully map out agendas, relationships, ideas, and proposals. (One possible drawback is that clients might find the art stuff distracting. In a recent staff meeting, I found myself only semi-following the discussion because I was focused on the awesome squid I was drawing).